With so much pressure to be punctual, uber-organised and disciplined in everything you do in Germany, it’s often easy to feel like you’re constantly breaking the rules, messing up and looking like a Vollidiot. Of course it doesn’t have to be like that. After twenty years in this country I’ve discovered that not even the Germans are total perfekt. Join in the fun and join me Being British in Bavaria. Of the 530,000 foreigners living in Munich, the largest single majority is made up of Turkish men (around 40,500). That’s followed by Greeks (ca. 26,000) and Croatians (approx. 24,000). You need to scroll much further down the list to find the number of Brits – some 6,000 – in the city. And still further to find the Irish contingent. And yet, when it comes to celebrating National Day in their adopted home of Munich, nobody seems to do it better than the Irish. As for the Brits and St George’s Day, perhaps less said the better. Most Brits would probably struggle to pin even an approximate date on the dragon fighter’s big day. April? May? June? Whatever. But 17 March, St Patrick’s Day, woaaaah! I’ve joined in the celebrations this year at the invitation of the Munich English language teachers’ organisation, Melta, of which I’ve been a member ever since arriving in Munich twenty years ago. Once again, the organisation is joining the mass procession which marches a mile down the Bavarian capital’s most prestigious street. This year it’s a particularly special occasion as they celebrate their thirtieth anniversary. Oddly enough, for as long as I can remember I've made up all manner of silly excuses for not being able to go. Things like 'Oh dear, nothing green to wear.' and 'Wait, do I really like Guinness..?' But this year it's different. I decide it’s time to finally get my act together. That means registering attendance online the day before and ensuring there’s a train connection that will land me in the centre of Munich pünktlich and with plenty Pufferzeit to spare before the midday march-off. Living out in the Hallertau, the trip needs planning with almost military precision. The planning pays off and everything goes perfectly. First of all, the train’s exactly on time. That’s no Selbstverständlichkeit, when you’re reliant on Deutsche Bahn for getting you from A to B. And then the weather. After a week of blustery wind and showers the sky has suddenly turned navy blue, it’s 21 degrees and sonnig. As we set off down the car-free Ludwigstrasse, I’m handed a fistful of tokens for free Guinness at the after-parade party. Oh, and a green felt top hat. Do the Irish really wear these daft things? Someone’s also given me a small flag to wave. It seems we’re not just promoting our teachers' organisation but also Ireland’s most popular dairy produce. 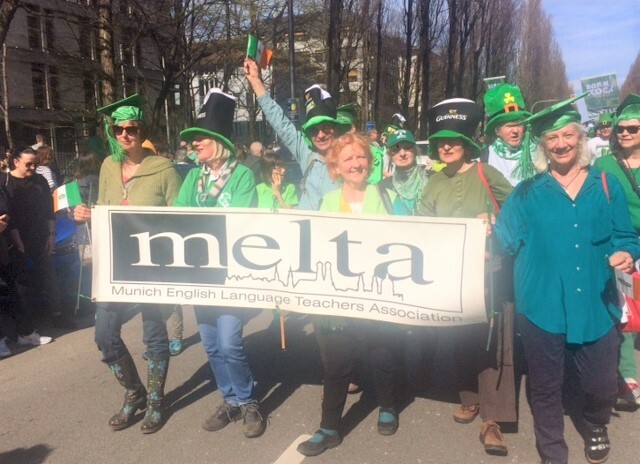 Although Melta has officially been part of the parade for around eight years some members can remember when the event originated in the mid-90s. According to Randy, back then it was just a small procession and the marchers literally had to plead with police to hold back the traffic and let them pass through (‘Wir wollen hier unbedingt durch!’). No fear of getting waylaid by traffic these days, of course. With a record 1,500 marchers representing 62 clubs and organisations, Munich has become the biggest mainland European celebrator of St Patrick’s Day outside Ireland. Ninety minutes later and we cross the finishing line at Odeonsplatz, best known as backdrop to Hitler’s failed beer hall putsch in 1923. 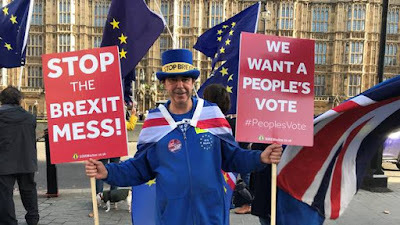 But wait, I’m suddenly left holding the banner on my own. Where is everybody? All the females, at least, have disappeared into thin air. Close to finishing line - and my free Guinness. Yes, some of us remember Logan as a cutesy twenty-something year old, Hugh Grant hair mop flopped over forehead. Today’s beer-bellied, long white-haired Logan looks more like he’d rather jettison his whiter-than-white image, jump onto a Harley Davidson and speed off in a cloud of dust. Savouring another sip of Guinness, I close my eyes and prefer to picture Logan performing in his heyday. I imagine him fighting off hordes of hysterical girls swarming the stage. Opening my eyes again, I can’t help noticing an elderly man propping himself up against a high round table. Resting his belly on the bar-stand, he drains the remains of his Guinness and says ‘Ja, ja, jaaah!’ It always strikes me as odd how, when spoken like that in German, such a positive word can actually sound so negative. Logan, meanwhile, is joined on stage by a full band. Grabbing hold of guitar, he starts strumming more traditional Irish tunes. Such as ‘Irish Soul’ and ‘The Wild Rover‘. Wait though, what’s he saying? No Johnny. I’ve just been googling you and you only won it twice. Lucky no else is fact-checking. How bizarre though. I could swear ‘The Wild Rover‘ was a dye-in-the-wool Irish song. But it turns out that everyone around here knows it as ‘An der Nordseeküste’. And so, here we stand in the shadow of an Italian Renaissance-style palace, shunkeling to an ageing Gaelic pop star belting out a Prussian sailor’s song. Only an Irish man could pull that off. Logan sings Hold me Now. More plea than proposition. Early evening, and, in keeping with proceedings, central Munich turns green too. Emerald-hued lights are beamed up and down major landmarks, including the Olympia Tower, Hard Rock Café and Molley Malone’s. But, this time, sadly not the Allianz Arena. World renowned for its innovative stadium-facade lighting, the arena is bathed in blood red. Having rolled out the red carpet all weekend to the Irish, Munich calls it a day when it comes to König Fußball. FC Bayern are playing Mainz 05. I’m no great football fan, but FC Bayern's 6-0 victory feels like a most befitting end to an all-round perfect day. 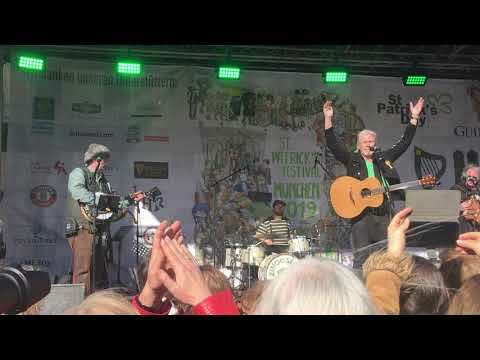 And a great warm-up for next year when Munich celebrates its 25th Paddy Party. High fives all round for "wheely" great tour of Munich. Just mind those naked sun lovers ahead! Delayed at Munich Airport? Frankly, I can't think of anything nicer.